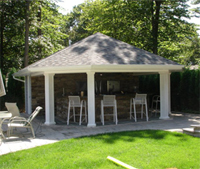 Harbor Hills Construction, INC. Offers custom design and planning. We have several Architects that we work with very closely as well as in house design specialists and draftsman. Harbor Hills Construction, INC. will also work with your architect. Picture yourself ordering a new car: You quickly reach a verbal agreement with the amiable salesman as to model, color, stereo system, and other accessories, just a few more technicalities and you’ll be the proud owner. You eagerly sign the contract, packed with legalese and fine print – time to get that fancy new car on order, wait for delivery, and start driving in style! When the car finally arrives, you discover that it has no motor or wheels. The salesman is very sympathetic to your complaints, but is powerless to resolve the matter; motor and wheels are not in the contract. They will have to be added to the final price as extras. Of course, this is a far-fetched example. This type of mistake is rare in the automobile business; but, due to the complexity of construction, mistakes and misunderstandings are common when dealing with the building trades. The old adage, “Penny-wise and dollar-foolish,” aptly applies to the purchase of construction plans. Contracting the cheapest designer or buying inferior stock plans could cost thousands during construction. The plans are the least expensive and most important item on the list of services and materials needed to build your custom home. Construction contracts and agreements are based on the plans. Therefore, to minimize disagreements and insure that your new custom home is properly built and structurally sound, the plans must be complete, clear, and comprehensive.